The It’s All About Birds! program served Oklahoma for 10 years by offering a free-flying bird show that traveled to venues across Oklahoma to educate students and the public about the value and wonder of birds. Because of state budget cuts, the program was shuttered in the Spring of 2016. Having the capacity to share live eagles and other majestic birds with the public brings the lessons to life. We are currently working to rebuild an outreach program complete with trained educational birds. READ ON TO SEE WHAT’S COMING! Because of our expertise in the avian world and past history with avian education, we know how to bring an exciting educational program into our schools and groups because we’ve done it before. Today, we have located an expert in falconry and avian education, living in Minnesota, who is leading education programs with children and is willing to bring her birds and relocate to Bartlesville, Oklahoma. 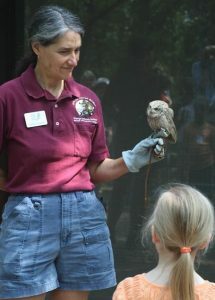 Dianne is a native of Southern Wisconsin and founder of Hoo’s Woods Raptor Center. 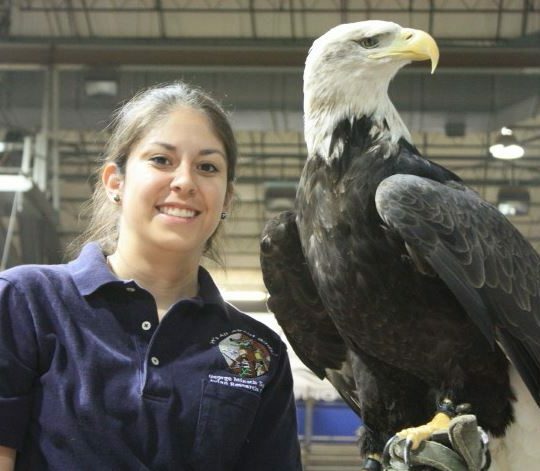 She is a licensed educator, falconer, rehabilitator and eagle handler through state and federal agencies. 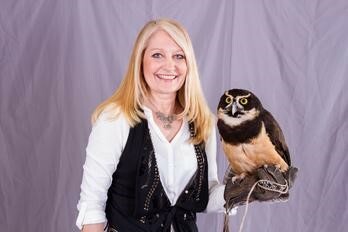 Dianne has served as Great Lakes Director and Public Relations Officer for the North American Falconer’s Association and was also a founder of the International Women’s Working Group for the International Association of Falconry. She has represented the U.S. at the International Falconry Festival in the Middle East. In April 2015, Dianne was awarded Wildlife Conservationist of the Year by the Wisconsin Wildlife Federation. Partnering with Dianne Moller, Hoos Woods, will allow us to bring the wonder of live birds to our students in such a way that our teachers can use the presentations to fit state curriculum requirements much more quickly than starting from scratch. We know that our schools are hungry for unique opportunities to capture the imagination of students and ignite their desire to learn more now. We are ready to bring that spark through our avian education program. Help us bring the message of preservation, as well as connect the value of birds to economic, artistic and historical significance. The George Miksch Sutton Avian Research Center’s educational program, “It’s All About Birds!” served Oklahoma for 10 years by offering a free-flying bird presentation that traveled to venues across Oklahoma to both educate students and the public alike about the value and wonder of birds. Between 2010 and the spring of 2016 more than 350,000 students and adults have experienced the program. It illustrates environmental conservation principles in a manner that is not only highly entertaining, but is also informative and designed to fulfill Oklahoma’s state educational objectives. We are willing to lead the way. In a world where youth and children rarely venture into wild places, experiencing live birds has powerful and lasting impact. Although the Sutton Center’s funding comes from a variety of sources, for 18 years, we were affiliated with the University of Oklahoma. This collaboration included the funding of our education programs that allowed young students to experience the wonders of nature as they learned how much birds contribute to our economy, health, culture and art. We are grateful for the support and collaboration during these years, but severe state budget cuts forced the University to discontinue the relationship as of 2016. Rebuilding the extensive program will take time. However, by securing the help of Dianne Moller we can take these first steps to begin working with students immediately while at the same time rebuilding a more extensive program. She not only brings trained birds but the expertise in connecting with the art community, leading children’s raptor camps and training young conservationists. This reality has led to renewed excitement and a sense of urgency to secure operational funding for 3 years. Initial funding of $170,000 per year for 3 years to get this project up and running for a total of $550,000.00 dollars. This would enable us to hire staff, update current facilities, acquire raptors and other birds to be trained for presentations, maintain existing transportation, provide maintenance and upkeep of the birds and build the technology components needed for web-based presentations. The entire program will be based at the Sutton Center in Bartlesville where the existing facilities can be used to house and train birds. The program is mobile and can adapt to the needs of individual schools. Presentations can also be done on site at the Sutton Center headquarters. The struggle to maintain our natural heritage, which includes both awe-inspiring creatures and the habitat; so essential for their survival, must not be lost or it will be gone forever. Educating young people to appreciate the beauty of diversity and learn to tell a story that will inspire others to preserve it aids the Sutton in our central mission of protecting the natural world for the next generation. The Sutton Award and education programs like the “It’s All About Birds” program are much needed and have a proven long-term impact, but your financial support is needed in order for them to continue. For as little as $15 per month, you can be a member of the Honor Roll for Education. Your gift is tax deductible.